Founded in 1948 by T.A. 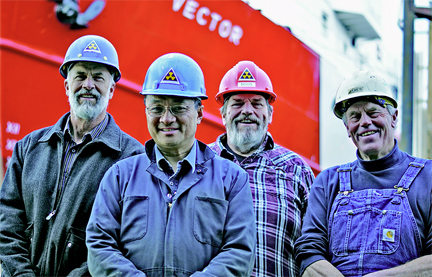 McLaren (1919 - 1999), Allied Shipbuilders is proud to have built 259 vessels during it's sixty plus years of continuous operation on the West Coast of North America. Located at the mouth of the Seymour River in North Vancouver, BC, Canada. The company provides shipbuilding, ship repair, and engineering services to the commercial marine industry on the Pacific West Coast. Allied Shipbuilders ownership change announced. Allied Shipbuilders Ltd. is an equal opportunity employer dedicated to ensuring that all job applicants and employees have a fair chance in a workplace free from descrimination or haras-sment.